There's more to come, and I'll try to update the event calendar soon. Of all the potential items: you should know about the concert fees discount that starts one minute after midnight AND you might want some time to contemplate spending 6 minutes with a running legend. Wednesday is National Running Day, so the Boston Athletic Association and USA Track & Field (New England) are hosting a "Mini Track Meet". "Novices and newcomers" are more than welcome; the whole idea is to get more people of all ages into running. There's races of different lengths as well as hurdles, long jump, and possibly shot put. Check this PDF for details. 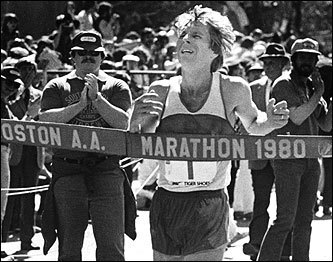 A) Run faster and endlessly brag how you beat Bill Rodgers in a mile race. B) Keep pace, then lie about beating him to your buddies. C) Accept that a 61-year-old man can run faster than you, and brag to your friends that you finished "X" minutes behind Bill Rodgers without mentioning the distance. This opportunity is on par with playing a game of pick-up basketball with Larry Bird, hitting batting practice with Curt Schilling as pitcher or being paced around Indianapolis Motor Speedway by Mario Andretti. "Sign-up and registration occurs on-site at the event. There is no pre-registration." If you're thinking about going to a concert at Harborlights or Great Woods, then you should think about buying your tickets tomorrow. SUN 6/28: Do You Make/Like Chili? 6/17: RSVP for F-r-e-e Tequila!